Nagi no Asukara is the story of two subsects of humanity: land-dwellers and sea-dwellers. As the culture of humanity on land grows, the more separate the culture of the sea becomes. Catastrophe draws ever closer as the population of the once-vibrant sea community dwindles, and the near-forgotten sea god preparing to freeze the land, tipping the balance of power back to the sea in the distant future. Faced with this calamity, four junior high school students, the last of the sea population’s youth, are caught in the friction between land and sea. Four friends from a village beneath the ocean become unwitting ambassadors to a village on land when their own school closes down due to a lack of students. 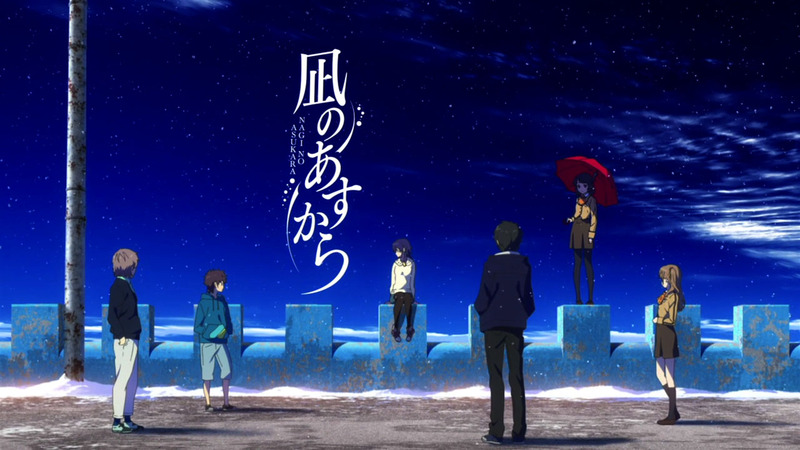 Tensions run high between the children from both the land and sea; however, as Nagi no Asukara progresses, individuals begin to form strong relationships, romantic or otherwise. These bonds lead to additional tension and understanding as the adolescents struggle to express or hide their respective emotions while a calamity looms in the horizon. The two paragraphs above are plot synopses for the same series: Nagi no Asukara. One focuses on the social and political narrative within the series, while the other focuses specifically on the character relationships. Chances are, if you are a viewer of the series, your emotional investment is firmly entrenched in the latter, rather than the former. It’s difficult to care about the overarching narrative of the world slowly going into a deep freeze when all you want is for Miuna Shiodome to find her happiness. It is a credit to the writing of Nagi no Asukara, headed by series composer Mari Okada, that it integrates both stories so well. One of the more interesting topics discussed in my high school health class – among the usual suspects of sexually transmitted diseases and the required viewing of the birth of a child – was the “placebo effect” and its relationship with alcohol consumption. First coined by T.C. Graves in 1920, but studied far earlier in the 18th century by physicians and pharmacists, the effect describes the alleviation of whatever symptoms a patient may have without receiving any actual medicinal treatment while believing that they have. The belief is important – “placebo” comes from the Latin “I will please” – as the results depend on the patient’s conviction more than the treatment itself. By definition, it is a medicine that pleases the patient more than it benefits them. With alcohol consumption, the placebo can be used to display the expectancy of the effects of alcohol without actually having consumed it. In other words, if I expect to be drunk and know the typical actions of one who is drunk, then I will display those actions when I believe myself to be drunk, regardless of the amount of alcohol I have, or have not, consumed. This varies from person to person, and there are variances in expectancy based on type of alcohol along with many other personal factors (i.e. people who have the same blood alcohol content can behave in drastically different ways). Additionally, this is not to take away from the fact that alcohol is a depressant and has specific psychoactive effects. 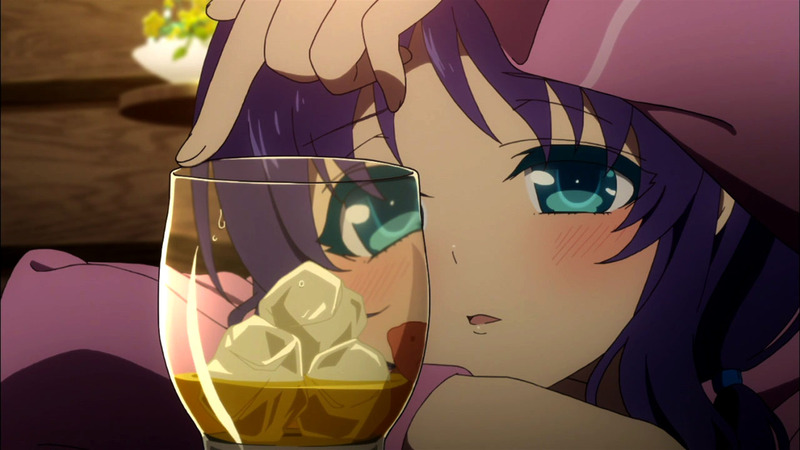 However, the idea that intrigued me the most in high school, and continues to pique my interest to this day, was the idea that if one wants to be drunk, then they will be. Five years following the above conversation, Chisaki’s childhood friend – and the object of her affection – Hikari Sakishima, emerges from stasis underneath the sea. He is unchanged from his 14 year-old self, both physically and mentally, while Chisaki, having spent those same five years on land, has grown into an awkward 19 year-old. Although the term “arrested development” is no longer used in developmental psychology, a loose definition of the term applies to what Chisaki has done to herself in these five years without Hikari and the entirety of the hibernating sea community. Forcibly separated from her family and friends in the Ofunehiki accident, the broken 14 year-old Chisaki is taken in by Tsumugu’s grandfather. She graduates high school and looks after her surrogate grandfather while Tsumugu attends university. Her conversations with Tsumugu, when they do speak to one another, are stilted and punctuated with short phrases and long pauses. There is little to suggest, in what we see of their relationship as well as Chisaki’s interactions with others, that Chisaki has allowed herself to grow at all. 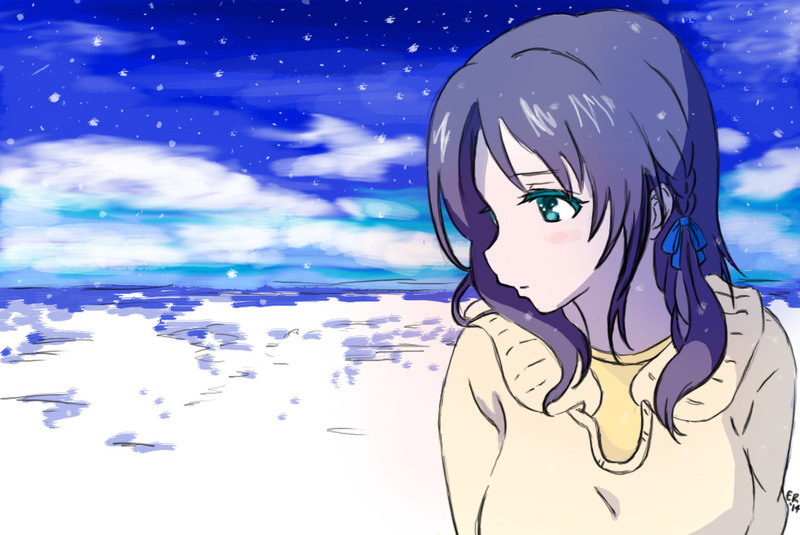 The scenery of Nagi no Asukara visually and aurally reinforces Chisaki’s state of mind. Cheery sunlit images of a lazy seaside town are replaced with the color palette of a constant sunset. Instead of the relaxing sound of ocean waves, the ominous dull thudding of ice floes can be heard. Like Chisaki, the town may have aged five years, but it too has gone into hibernation. The series constantly reminds us – through her character design and casual remarks from friends and family – that Chisaki is now physically 19; however, she hasn’t allowed herself to live through the past five years without Hikari, placing herself into a forced emotional stasis.